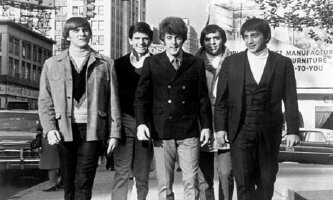 In 1963 a young Tommy James and his band The Shondells cut four singles for a local record lable in their home town of Niles, MI. One song, Hanky Panky, was a local hit but the record label didn’t have the resources to promote it. After their career fizzled out The Shondells broke up and Tommy James got a job in a record store while trying to keep the dream alive. A few years later a disc jockey in Pittsburgh found Hanky Panky in a record bin and started playing it on the air. The response was immediate and overwhelming, to the point where someone ran off some bootleg copies (yes, it happened even before the digital age) and sold an estimated 80,000 records in the Pittsburgh area. Once word got back to James he put together a new Shondells and hit the road to capitalize on the success. With his new found popularity there was no better time to look for a record deal but for some reason none of the major labels showed any interest, despite having one of the hottest records in the country. The mystery was solved when word got back to James that Morris Levy with Roulette Records had notified every other label to stay away, he intended to sign the Shondells. Why would Levy’s word carry any weight with his competitors? Roulette was a front for the Genovese crime family, one of the Five Families of the New York Mafia. The Shondells signed with Roulette and went on to have a string of hits through the 60’s. According to James, the group lost out on millions of dollars in royalties that Roulette skimmed off. He recently wrote a book detailing the whole story so if you have a chance to see him you might want to go because he could disappear one of these days. The next hit for the band was I Think We’re Alone Now, which was famously covered by Tiffany in the 80’s. The Shondells version made it to #4 on the charts. The band was stuck trying to come up with another song so they played I Think We’re Alone Now backwards and based Mirage on what they heard. Take a listen, you can definitely hear the backwards-inspired sound. Many of the band’s hits were written or co-written by songwriter Richie Cordell. At one point Cordell and James decided to write a party song. They came up with some lyrics and a hook but were stuck for a chorus and title. As they stepped out on the balcony they saw a big neon sign for the insurance company across the street: Mutual Of New York. MONY. Bingo! Problem solved and the song was a huge hit for The Shondells (and Billy Idol 20 years later). James had the idea to record a video for the song, something that just wasn’t done in those days. The video wasn’t particularly innovative (other than being one of the very first music videos) and wasn’t played on TV until MTV debuted. I’m sure the 80’s kids got a kick out of dad’s Nehru jacket. In 1967 James realized the music industry was changing to a more album oriented industry and The Shondells needed to adapt. Their first step in the new direction was the psychedelic Crimson and Clover (covered later by Joan Jett). To reflect the new direction Tommy has traded in his Nehru to go with the Austin powers look. As for the mob connection, there’s a happy ending: after the wiseguys all died Roulette Records was sold to EMI and Rhino Records and Tommy is finally getting royalties for all those songs he wrote, and I’m assuming that includes all the cover versions.